A camel and his handler wait for tourists at the Giza Pyramids near Cairo, Nov. 8, 2015. Egypt's Tourism Minister Hesham Zaazou said the government was doing all it could to secure airports and tourist sites. Tourism in Sharm el-Sheikh was picking up again after years of political turmoil, with so many Russians enjoying the sun and fun that local beach aerobics instructors used the visitors' own language rather than Arabic or English. Life was at last starting to look good for residents of the Red Sea resort, but that was before an airliner taking Russian tourists home broke up over the Sinai Peninsula, where Islamic State militants suspected of planting a bomb on the plane are waging an insurgency. The Oct. 31 crash killed all 224 people onboard. Now the future looks grim for thousands of Egyptians, from taxi drivers to diving instructors, who flocked to Sharm el-Sheikh to find jobs. One tour company official predicted holiday packages might now have to be discounted by up to 50 percent. "I have been working in Sharm for three years but this is the first time I have ever seen it so empty," said Ahmed Rabie. He spoke outside the cafe he runs in Naama Bay, at the resort's heart. Chairs were stacked on tables and not a single person was sitting inside. Usuall, he added, "all these cafes and restaurants would be full." Rabie pays 30,000 Egyptian pounds ($3,700) a month to rent the space, in addition to operational costs. He told Reuters many small business owners had closed after Western governments announced that the Airbus 321 was likely brought down by a bomb and then suspended flights to Sharm el-Sheikh, with Russia following suit. "We are waiting for two or three days to see what happens, but if it keeps on like this we will shut down and leave," Rabie said. With low prices, cheap package deals and plenty of hotel rooms, Sharm el-Sheikh was a driving force behind Egypt's efforts to lure back visitors. It was starting to buzz. Then the Russian plane crashed, with Islamic State group terrorists claiming responsibility. This immediately alarmed Egyptians, acutely aware of how vulnerable tourism is to such violence. A vendor, front, awaits customers for an excursion trip at the Red Sea resort of Sharm el-Sheikh, Nov. 8, 2015. On November 17, 1997, Islamic militants descended on Queen Hatshepsut's temple near the Nile town of Luxor, then shot or hacked to death 58 tourists and four Egyptians. The following January and February, visitor numbers were down almost 60 percent from the previous year. The industry staged a remarkable comeback, but it took years. Last month, Tourism Minister Hisham Zaazou said tourism, a pillar of the economy, expected moderate growth this year with the aid of a global advertising campaign. President Abdel Fattah el-Sissi has restored some stability since the army toppled Islamist President Mohamed Mursi in 2013 following mass protests against his rule. But it has not been enough to persuade large numbers of foreigners that it is safe to return. Last year, 9.9 million tourists visited Egypt, far less than the 14.7 million who came in 2010, the year before the Arab Spring revolutions convulsed the Middle East. An official at Sharm Travel Solutions, a British-owned Sharm el-Sheikh tour company, said holidays in the resort could be discounted by up to 50 percent, if they can be sold at all. "They may sell these holidays at half price but with flights suspended will anyone buy them?" the official asked. Other tour operators are offering holidays to Sharm el-Sheikh with price cuts of up to 200 pounds ($300). A walk through Naama Bay revealed idle establishments, all with Russian signs to cater to the resort's largest clientele. The resort's famous beaches fare only slightly better, with most just half full. The prospect of a sharp decline in tourism receipts has left many scrambling to make sense of the sudden air disaster. Some are in denial. "There are invisible foreign hands behind this," said Mohamed Abdelaziz, who runs a safari trip business. "Egypt lies in a strategic location and other countries are spiteful of this. Sharm is very safe, the police are even sometimes unfair to us to make sure it is safe for all guests." 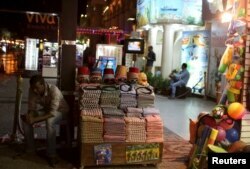 Many tourists interviewed agreed that Sharm el-Sheikh felt safe. Airport security was the problem, not the resort itself. "Personally, I felt sorry for Sharm as a resort when I heard about the plane crash. I've been here 14 times and I've never had a problem," said British vacationer Vini Kneale. If it turns out a bomb brought down the Russian plane, however, it would "discourage me from coming back," he said. The Egyptian resort of Sharm el-Sheikh has been a source of hope for the tourism industry until a deadly airline incident Oct. 31, 2015. The crash sets back an already battered Sharm el-Sheikh tourism scene, said taxi driver Mohamed Odei. "No one used to come here except the fat cats, people with thick wallets. Now if a tourist wants a budget holiday, they come here. And even that is coming to an end." Airport security was the main concern that drove British Prime Minister David Cameron to suspend flights to Sharm el-Sheikh. New regulations are now in place, but for many it is too late. "Egyptians don't search well until there is a catastrophe," said Odei, driving his taxi through a checkpoint outside the airport. Police officers with assault rifles and soldiers circled his car, checking the trunk and his documentation. Odei, originally from the Nile Delta city of Mansoura, has been working in Sharm el-Sheikh for seven years. He initially ran a restaurant but was forced to shut it down in 2005 after a suicide bomber attacked a market place and a hotel. He noticed a sharp drop in passengers after flights were suspended. "We now get maybe 30 percent of the passengers we usually get, and they all want to go to the airport," he said. "I have never seen such crowds at the departure gate before. Usually, it's the arrivals one."